It was in the early morning here in Canada of November 13, 2016. Sleepily checking my Facebook, the very 1st entry on the newsfeed immediately caught my attention and had me completely wide awake. It was from my daughter who was in New Zealand attending teacher’s college. 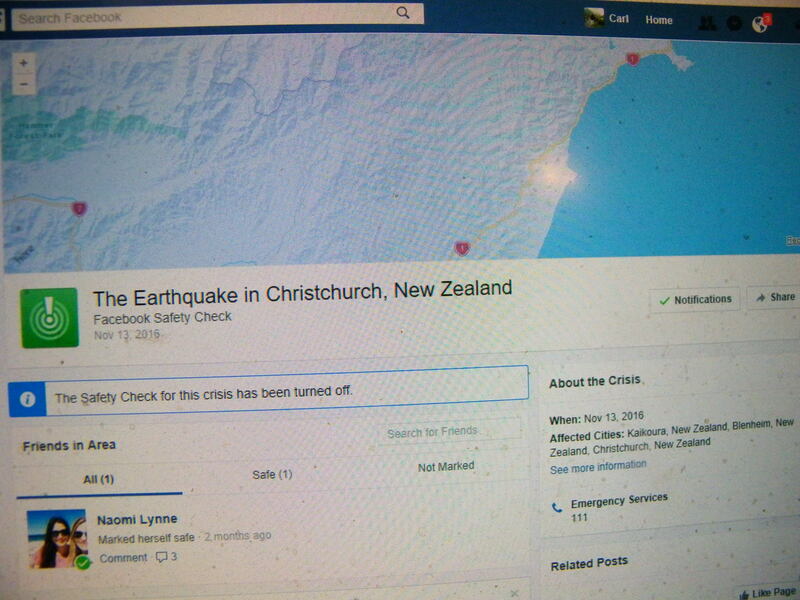 The post was a part of a special “Facebook Safety Check” with the headline “The Earthquake in Christchurch, New Zealand”. Using this page people caught in an natural disaster emergency crises can notify loved ones around the world that they are “safe”. I had no idea of the earthquake or its severity, all I knew my girl was “currently” safe. Feeling very helpless on the other side of the earth and unsure of what to now do, a message notification popped up from my girl. In it she mentioned she was up pretty much all night huddled under her desk, the earthquake and numerous aftershocks were that strong but she was okay. 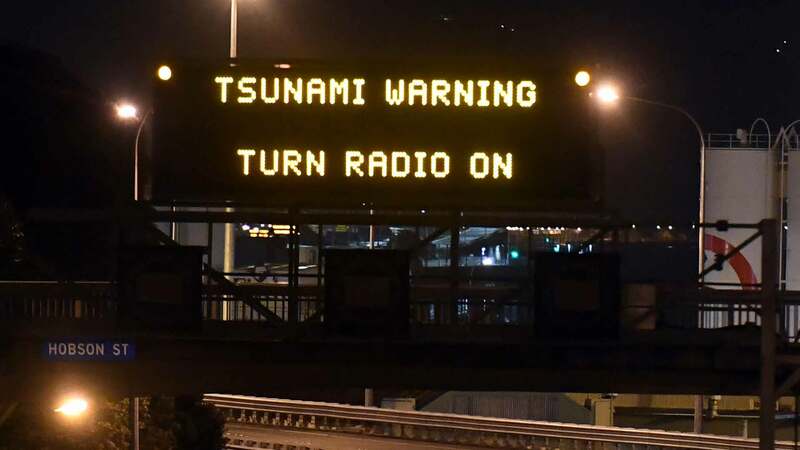 But what was now concerning me was the live updates on right side of that Facebook page, namely tsunami warnings and an evacuation of everyone within 1 kilometer of the coast. I thought my daughter was a fair distance from the coast and without seeming like I was too paranoid of a father I did a quick search without her knowing to find out how far she actually was from the coast while we were “chatting” on Facebook. She was well beyond that one kilometer zone. 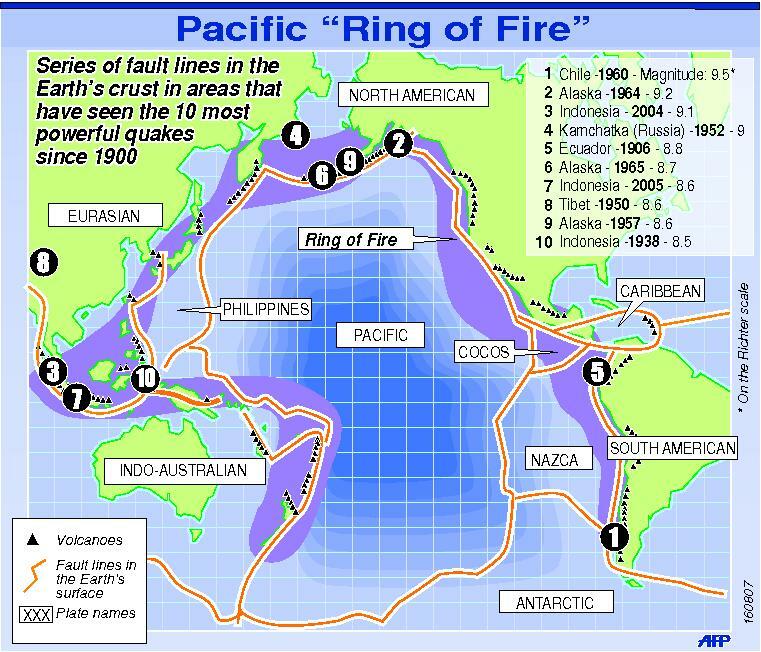 Sitting directly on what is known as the Pacific Ring of Fire, New Zealand has a long and storied history of earthquakes. 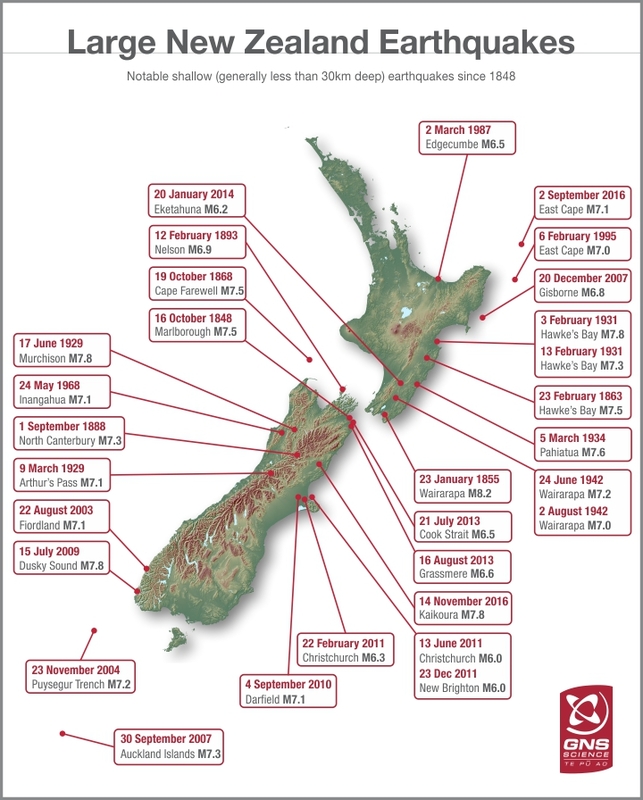 Since 1848 there has been 30 earthquakes in New Zealand that have had a magnitude of 6.0 or more. 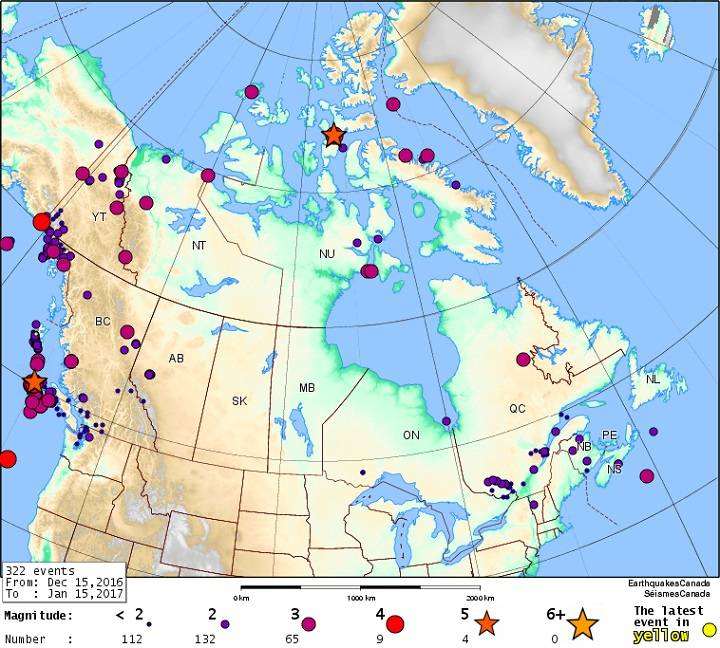 Although many parts of Canada where I live are prone to seismic activity, personally I have never felt an earthquake. I live in Central Canada which has been unscathed by the massive destruction of the massive earthquakes. The vast majority of earthquakes that strike Canada are in British Columbia and found in that same Pacific “Ring of Fire”. In this Global News Report, it mentions British Columbia , Canada is “prone to the largest earthquakes in the world, the mega stress earthquakes with tsunami. Those massive earthquakes, often called “the big one”, happen every few hundred years. The last “big one” to strike along the B.C. coast was on January 26, 1700″. The most recent earthquake that struck New Zealand (which involved my daughter) was a magnitude 7.8 and said to be one of the strongest ones to hit since 1848 (there was only one stronger that occurred in 1855 at an 8.2). The 2016 earthquake was centered north of Christchurch at a rural area called Kaikoura, well known for it’s whale watching tours and having a penguin colony. The casualty level was only 2 people (although each loss is very tragic). Physically this earthquake caused a lot of land upheaval. This article mentions there were over 100,000 landslides caused by the earthquake. There were 29 landslides that covered the only main State #1 highway through this area. Approximately 20,000 people were completely cut off from the rest of the country and had to be evacuated by air and sea. Access to this area by road or rail was impossible for over 6 weeks (including the entire time I was in New Zealand during December 2016). 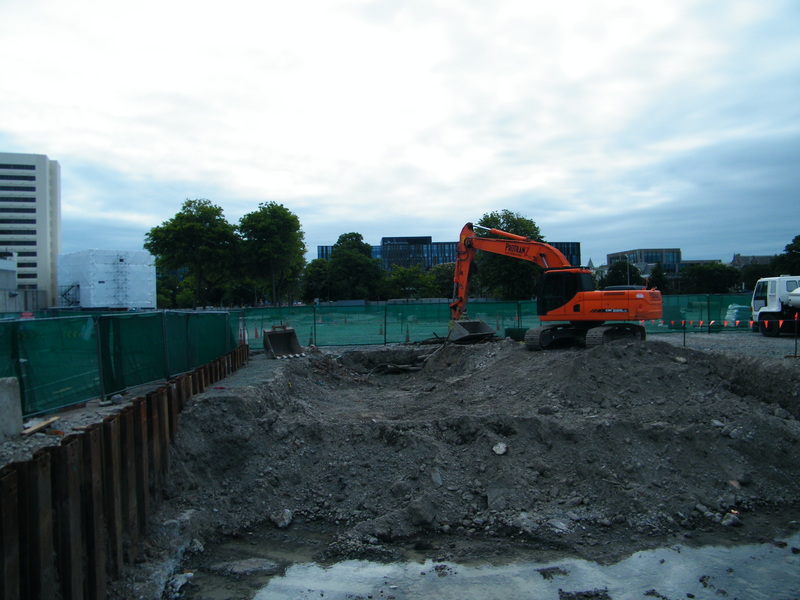 In comparison the February 22, 2011 earthquake that hit the city centre of Christchurch during a busy noon hour experienced a tragic loss of 185 lives. The magnitude of this quake was a much lower 6.3. 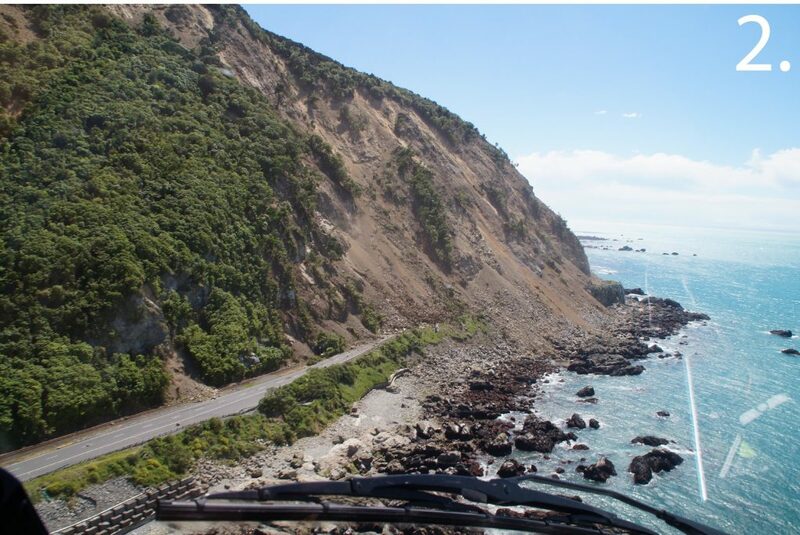 One of the landslides that covered New Zealand State Highway #1 from the 2016 earthquake. Image source. 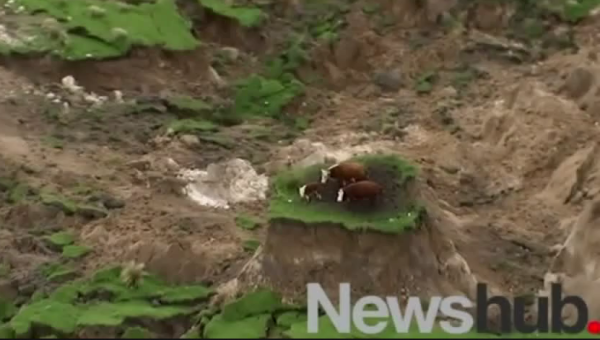 Another landslide stranded these cattle. Image Source! 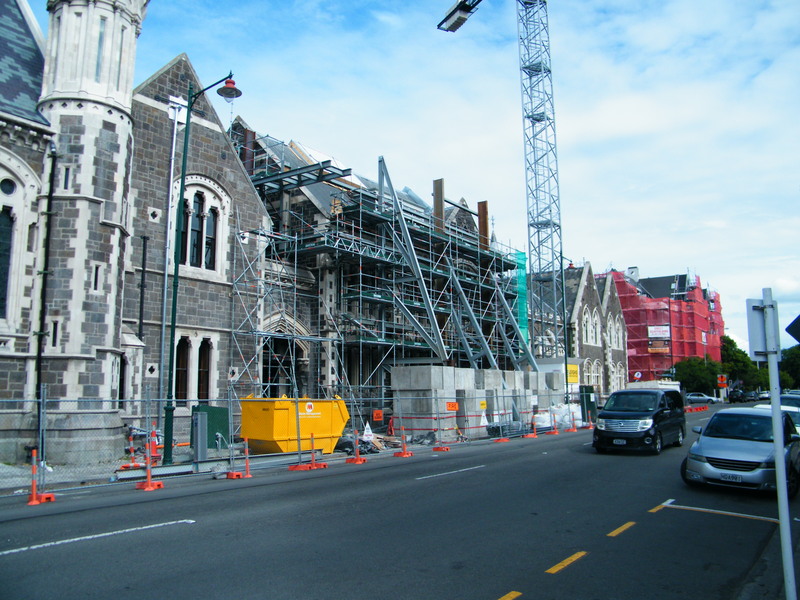 The magnificent Christchurch cathedral before the Feb. 22, 2011 earthquake. Image Source. During our honeymoon 28 years ago my wife and I spent 3 or 4 days in the city of Christchurch. 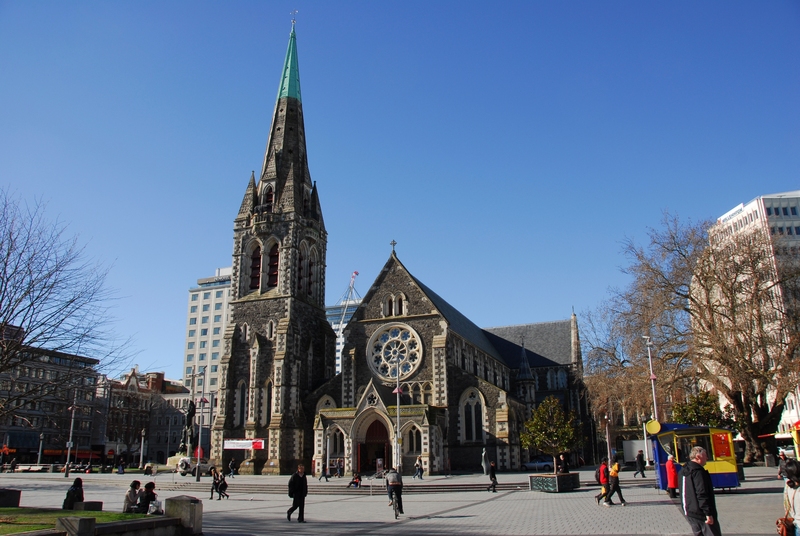 We did the “tourist thing”, saw many magnificient historical buildings and even climbed up to the bell tour of Christchurch’s most famous landmarks, the Christchurch cathedral. There was mixed feelings coming back to that city centre. It was great to return, but sad to see as most of those beautiful buildings gone or fenced off in ruins as a result of the earthquake. 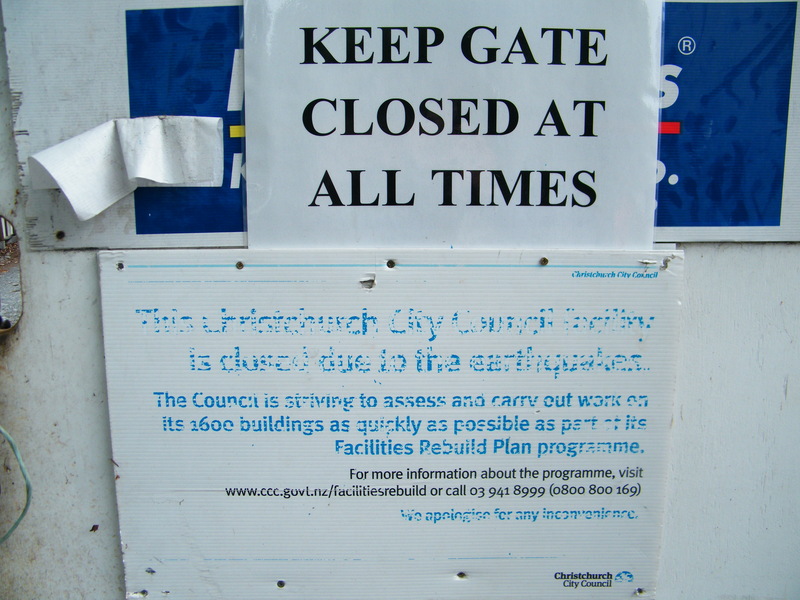 The city centre of Christchurch was pretty much destroyed. Took this picture of this faded sign. Over 1600 buildings were closed as a result of the 2011 earthquake. 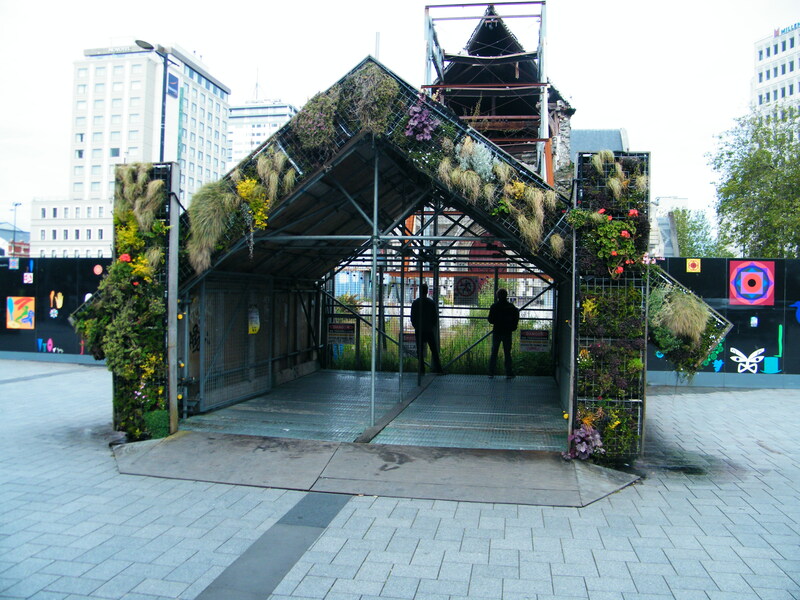 It had been 5 years and 10 months since that earthquake from February 22, 2011, and Christchurch is a city continuing on a massive rebuilding program. Everywhere you go in the city there is construction, both in road work and building construction. In many parts of the downtown centre entire city blocks are vacant. The buildings that once sat there had to be demolished because the damage from the earthquake was too extensive. Historical buildings such as this one having a major restoration from the earthquake damage. On the other hand many historical buildings are undergoing major repairs and restorations. Scaffolding it seems is found everywhere, sometimes entombing an entire building while restoration takes place. This building sits in a cocoon of scaffolding while major restorations take place. 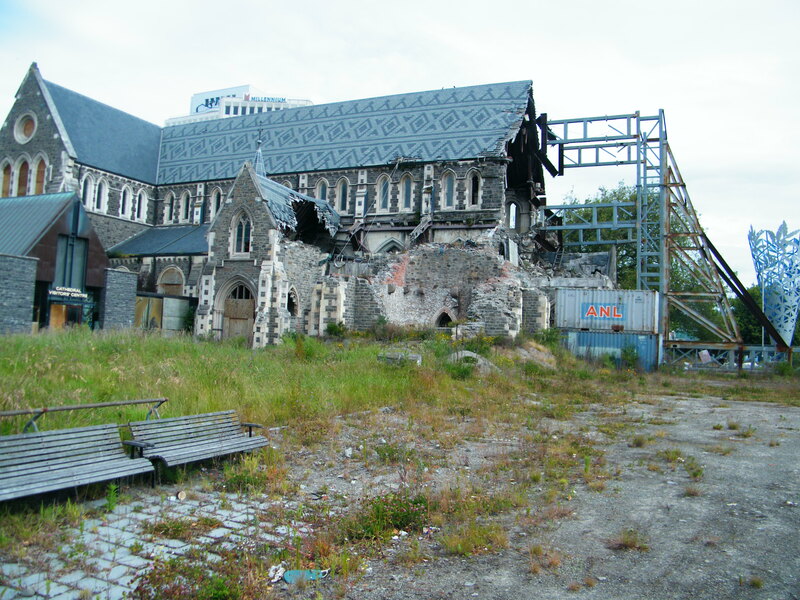 For me the most emotional place I witnessed was Christchurch’s most iconic landmark, the Christchurch Cathedral fenced off and sitting in ruins. Large steel girders have been attached to stabilize it but nothing in the form of restoration has yet to take place. The bell tower where my new wife and I climbed up into toppled during the earthquake, and the main front remains completely open to the elements. Reinforced with steel girders the left of the picture is where the bell tower used to be. The inside of the church is open to the elements. Was able to get the lens of my camera through the security fence to take the picture. 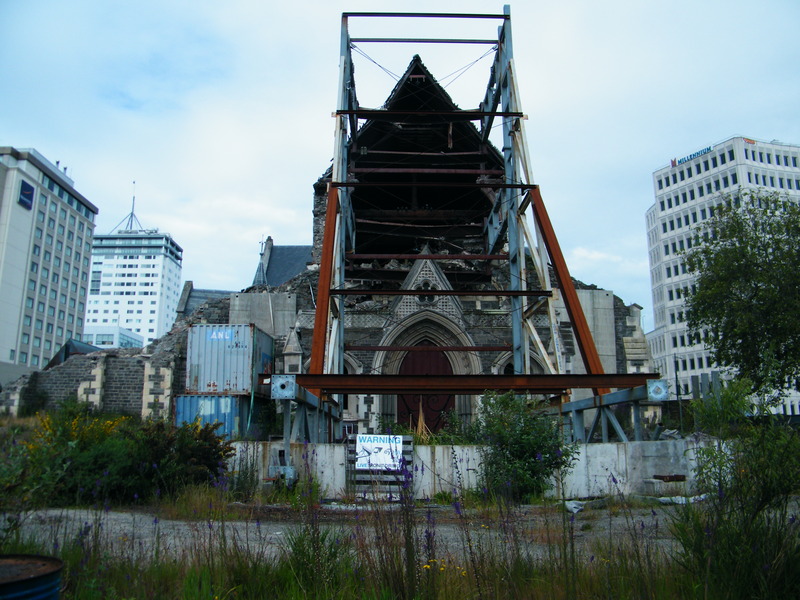 The future of the severely damaged Christchurch Cathedral is mired in controversy. Many locals love the historic landmark and say it should be restored to its former glory. Many others say the damage is too extensive and it should be demolished. Meanwhile it languishes in its damaged state and deteriorates with the passing of time. 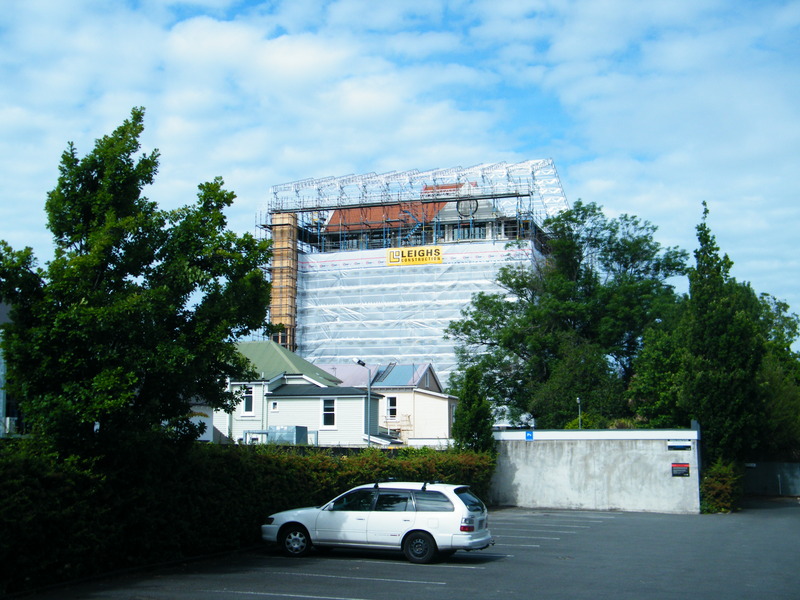 Side view showing the damage of the Christchurch Cathedral. A memorial in Cathedral Square using part of the Cathedral to remember the 185 lives lost in the 2011 earthquake. The cathedral is behind it in the background. There were “priority projects” to try to bring people back to the core after the devastation, namely what is called the “Restart Mall” and a brand new bus station after the old one was destroyed. 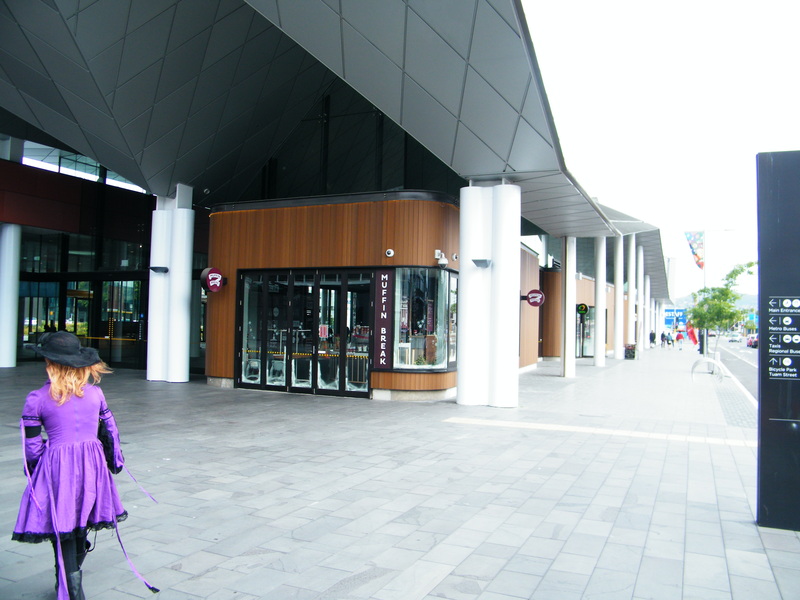 The Restart Mall is built from shipping containers and was built as quickly as possible to get people back to the central core. This is only a small part. It is quite huge. Brand new bus station to replace the old one that was destroyed. The 2011 earthquake not only affected the central core of Christchurch, but many neighborhoods. One of these neighbourhoods is where my daughter has just started teaching. When visiting I mentioned to her that everything was new in the neighbourhood, including the school. My daughter replied it was because the old neighbourhood was destroyed with the earthquake. Signage at the outside entrance of the school my daughter is now teaching at. School just completed a year ago where my daughter is now teaching. 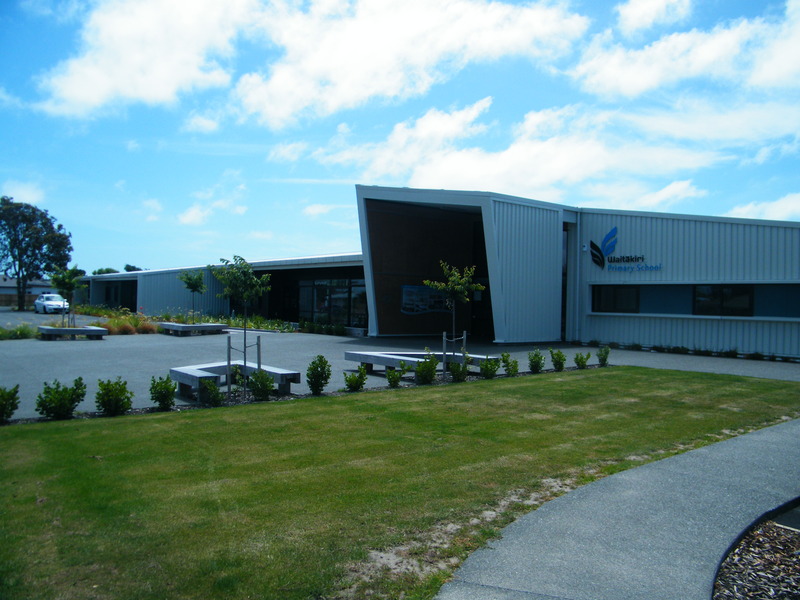 Nearly every public building I visited in New Zealand had in or around the entrance an emergency procedure in the event of an earthquake. The procedure is called “DROP, COVER, HOLD”. The New Zealand government has an excellent webpage on earthquakes for school classroom learning called “What’s The Plan Stan“. With any natural disaster being prepared goes a long way in surviving better through it. Infographic on the different environments you may be in during an earthquake. Image source. Do you live on one of those earthquake fault lines? Have you ever experienced an earthquake? If you have what was it like? Have you experienced any other natural disasters? It must have been scary for you Carl. I hope your daughter is enjoying NZ. I’ve never been there myself but I know people there that I one day hope to visit. It is really good to see you here Sue. It was a bit scary, so far away for me in Canada and feeling quite helpless. My daughter LOVES New Zealand. During my visit in December I can see why. It is such an unpolluted wholesome country to live in. Yeah I HAD to find out about those cows myself. You can’t leave there stranded like that and was nice to know they did get off that mini island. Earthquakes can be scary…glad to hear your daughter is safe… I had experienced earthquakes a few years ago and the thought of it still shakes me up! Thanks for sharing this Anisha. I have wondered if there is any trauma that can come back when the thought of an earthquake comes to mind. Sincerely hope the post did not bring back too many bad memories for you. They would be scary. Not at all… be rest assured of it… life makes you strong enough to deal with some experiences and memories! I am so glad all was well for your daughter but I can imagine the fear that flew through you when information was hard to come by. I lived in Darwin (Northern Territory, Australia) for a few years in the 1980s. One morning, working away in an open office upstairs of a 2 storey building I heard a deep subterranean moaning, then I began to move involuntarily. What fascinated me most was that the large bookcase in the distance, which consisted of tiers of wooden planks resting on concrete blocks was moving in ways it should not. One row went to the right while the next row went to the left – I knew then we were in the midst of an earthquake. Somehow remembering all I knew about marshalling people, without panic in my voice, I boomed out to everyone to put down what they were doing and leave all together down the stairs NOW not later. So we stood outside for a while. I dont remember aftershocks but it was a novel way to break up an otherwise tediously normal morning. Some buildings across Darwin suffered damage but it was all fairly minor. Across the eastern part of Australia we often have very mild shocks including in my state of Tasmania (the most recent about 1.5 years ago) – but these are often the sort which does not wake someone from sleep. 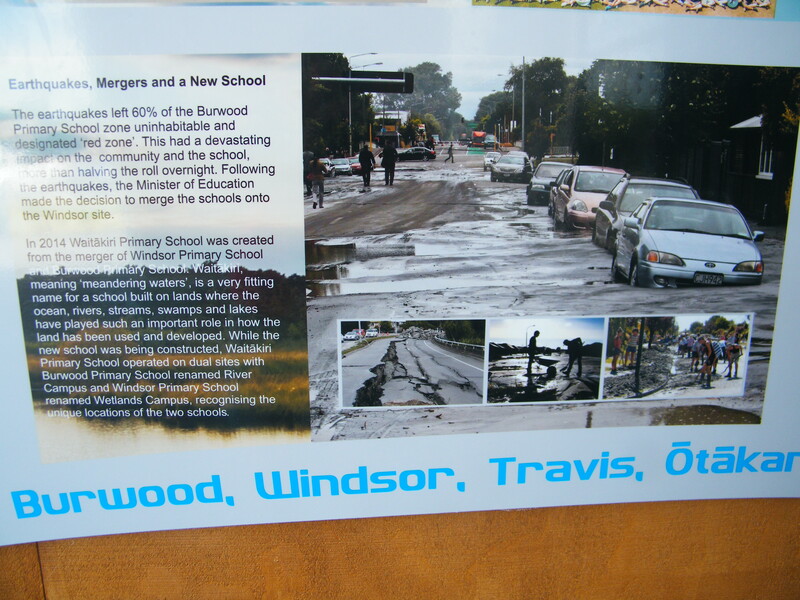 By contrast, Newcastle, a city just north of Sydney suffered a major quake in 1989 with lots of damage and 13 deaths. The hardest hit suburb, Hamilton, was where I lived until a year before the quake. Thank you for reading and sharing such a substantial response in your comment. I admire you for how you were to keep calm in the situation and marshal the people. I always wonder how I would react. My daughter has been through a few minor quakes before that big 7.8 that hit last November. The 1st smaller one she was hanging out with friends and the ground started shaking. They just carried on as if nothing was different. The big one last November she instinctively knew this was much different. How’s is your daughter holding up now? Must be very scary for her. Being involved with state earthquake planning would be quite freakish. You would get to know all the facts and statistics and of course the “worst case scenarios” if per chance “the big one” does let loose. So interesting you mention “Cascade Fault” for the fault in your area of Northern California. New Zealand has names for their faults as well. There has been lots of earthquakes over the years on different faults, but the one there that is concerning the people is on the South Island called the Alpine Fault that runs the entire length of the South Island. Earthquakes and fires are part of the California landscape. I experienced my first earthquake at age 5, enough to knock me out of my little chair. They trained us back in the 60s how to take cover under our school desks. Every part of the world has it’s brand of natural disasters. I’m ok with the devil I know. Glad your family is ok and nice to see Facebook’s app for reporting safety. Thank you for sharing Terri. And so fascinating to read about the earthquake drills that you were engaged in while you were in school. 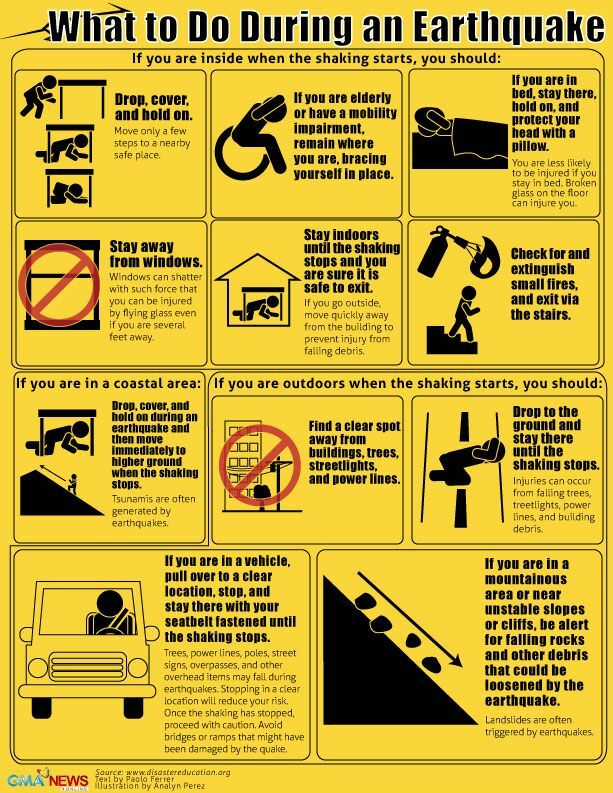 I am very naïve when it come to earthquakes procedures, so I tried to be a bit knowledgeable by reading up on them before I landed in New Zealand. I see the wildfires on the news in California from time to time. They can be so destructive and difficult to bring under control. My area (Barrie, Ontario) is in a bit of a tornado path. The worst was in 1985 which claimed 8 lives and destroyed 300 homes. I was a volunteer firefighter at the time and we painstakingly searched through the rubble looking for bodies. I can only imagine how scary it was to be messaging with your daughter during such a time. The photos of the damage really hit home. As much as we complain about the weather here I have to say we typically don’t face a lot of the natural disasters that many parts of the world do. Thank you for taking the time to read and respond Sue. It has been over 5 years since the 2011 earthquake and still so much damage they have not got to yet. My daughter was saying they are just getting to many of the damaged homes now. I must say I am very fortunate in my area of Canada as well. The weather indeed is the main thing we complain about. That earthquake that happened in Christchurch a few years back was so scary. Hearing about any earthquake is scary. We hear all the time how Vancouver is planning for the big one. I’ve felt only 2 small earthquakes – one when I lived in terrace and one where I live now. It was very small so nothing to report really. I couldn’t imagine having to experience a big one!! Vancouver is such a built up city. I can’t imagine what it would be like if “the big one” were to strike. With the 2 New Zealand earthquakes from last year (rural) and 2011 (urban) there is so many more casualties and damage when the epicentre is urban. I am certainly glad that both earthquakes you felt were small ones. So glad that your daughter is safe. Can’t imagine how you felt. Helpless and terrified would be my guess. I experienced one in Los Angeles a little more than 20 years ago. Again, you are helpless, and scared. And the after shocks just keep coming. Here in Denver we normally do not get any that you really notice. Another plus for Colorado. Again happy your daughter, and you, are fine. Thank you for reading and for your input through your comment. I do remember news pictures from that Los Angeles earthquake. One that is still impressed on my mind was an overpass flattened and cars that were crushed underneath. It must have been such a helpless feeling wondering if you would be safe where you were at and if those aftershocks would ever stop. The aftershocks is what my daughter remarked about the most. They just kept coming. Some were very strong, and each one would weaken a structure a bit more..
Colorado is one state that I have yet to visit. We get snowstorms that come up into my area of Canada called “Colorado Lows”. I have always wondered why they are called that. 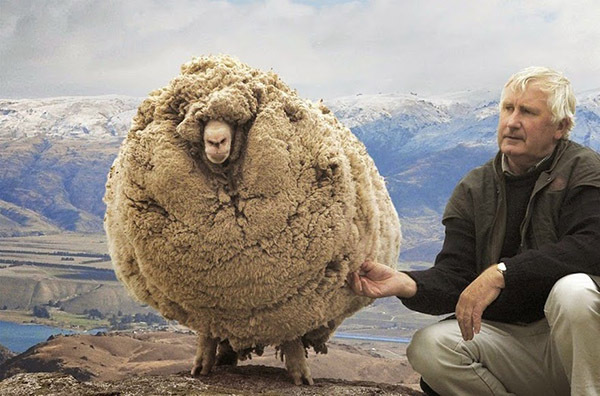 I am glad to know your daughter is safe, Carl. I have seen first hand what devastation these calamities can cause. It is the human spirit that sustains and grows out of it, one brick at a time. I’ve been in a couple small earthquakes when I lived in Japan – but I didn’t even know they were happening, I had to be told the next day. I think they must have felt like trucks going by! I did have a tornado go through my neighborhood in Indiana – that was quite an adventure. Thankfully, no one was hurt, and only a few houses had any serious damage. Thank you for taking the time to read and share Sarah. When I was in New Zealand I kept thinking “earthquake” if there were anything out of the ordinary. And my daughter would reply that “No it is just a truck, or a strong wind, or something else like that”….haha. I think we do share the same “tornado alleys” you have in Indiana. They will originate in the United States and their paths sometime move up here into Canada. So glad you and everyone else in your neighbourhood were safe and unhurt from the tornado. Their paths can be unpredictable, one house will still be standing and the house beside it can be destroyed. Glad your daughter is safe. Here in New York we rarely have earthquakes. We did have one a few years ago but it mostly affected Virginia and some other east coasts states. New York worst weather comes in the winter with snow storms and blizzards. A few times such blizzards have shut down the entire city. Sometimes people die, police find people frozen in their cars, also slips and falls from freezing icy conditions, heart attacks from shoveling snow. I really despise winter because it is so dangerous. Nothing fun about it. Can’t wait until spring time!! Thank you for taking the time to read and for sharing such a detailed response DeBorah Ann. Those snowstorms that strike the Eastern coast where you live can be devastating. I read about them on the news. Sometimes we will get the “tail end” of those storms where I live in Ontario, Canada but the brunt of them are on the east coast. In Italy earthquakes are frequent and serious – though I have experienced one there. But when we used to live in Istanbul the cups rattled in the cupboard several times a week. And most of the time, there’s no harm done, I’m glad to say. WOW Mette this is incredible. People in Istanbul must get used to cups rattling like that several times a week. I could see myself on edge all the time. Italy has seen some very powerful earthquakes throughout history. The one you experienced would no doubt have made some lasting impressions. Wow, this is something nobody wants to hear! Scary! Thanks for reading Cecilla. It definitely would be scary! Hey Carl, I know I’m a bit late to the party with this post but I am really glad both your daughter and the cows turned out ok. How scary that must have been for you not knowing what was going on. Earthquakes are definitely no joke. In California we definitely have our fair share but so far down south where I am at they have been pretty mild. Always so wonderful to have your visits Tricia. Yeah being so far away and not knowing what was going on there were some anxious times for me. After witnessing the damage from the earthquake almost 6 years earlier during my trip in December I definitely can see they are no joke. And something not to betaken lightly. So glad that the earthquakes in your area of California have been milder in nature. I was not aware that different parts of your beautiful state have areas where the earthquakes have stronger intensities. This is helpful! I was in an earthquake once, and i had NO IDEA what to do. I stood there, frozen in place, by the time I figured out what was happening, I grabbed all my children and my phone and ran outside. One of the poor dears was still in his underwear. They were very small back then. 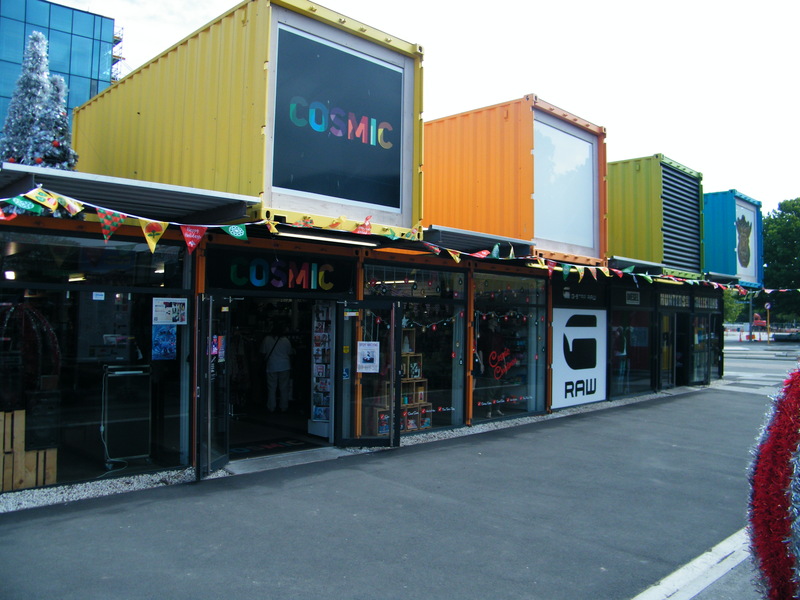 I love the mall made of shipping containers. I don’t love the destroyed cathedral. I hope they rebuild and restore! It was so beautiful and was built for God, something we need more of. You did well April. This is a HUGE thing to look out for the safety of not only yourself, but also for your children. Your mind must have been really spinning. I probably would not recognise an earthquake when it would happen. I thought an earthquake a half dozen times in New Zealand, and my daughter would say: “oh its just a plane or a truck rumbling by”. She kept telling me earthquakes are not loud like that…haha. I was crying when I saw the damaged cathedral. It was pretty emotional for me. I do hope they rebuild and restore the cathedral as well. It is quite cool the cathedral and cathedral square is the central hub. And the roads that were originally built in the downtown core of Christchurch directly led to it.